One of the world's most influential rap artist Kanye West announced that he will be going on tour after three years. This announcement was made via the internet and is the first North American tour in three years for the controversial rapper. Known for his outlandish views and sometimes unnecessary rants, Kanye is also a well-renowned artist. His visionary take on art is impeccable and he has the skill to make us really think about life and all aspects of it in a different light with his delivery of words. On top of being a magnificent musician, Kanye also has a high-end clothing line called Yeezy. The twenty-two time Grammy Award Winning artist has sold over thirty million albums worldwide. The Life of Pablo has made history as the first album to debut at the top of the Billboard 200 Album chart based on streaming only. The album is the seventh consecutive number one album. The Saint Pablo Tour is making a huge return to North American arenas for the first time in three years for the artist. In 2013 Kanye's Yeezus tour sold out crowds in unprecedented acclaim. The tour is set to have new standards for the visual medium[S1] and [S2] is the most anticipated tour of this year. The North American tour promoted by Live Nation is set to launch on August 25th, 2016 at Bankers Life Arena in Indianapolis, IN. West will visit nearly 40 cities across the U.S. & Canada. Cities include New York, Los Angeles, Chicago, Miami & Toronto. This is most definitely a ticket you want to buy. Tickets go on sale June 18th on the Live Nation website for the general public. American Express Card (AMEX) members are able to purchase tickets on Tuesday, June 14th at 10:00am until Friday, June 17th at 10:00pm. Tidal members will have access to the pre-sale that will begin on Thursday, June 16th at 10:00am local time. Montreal pre-sale begins at Noon. 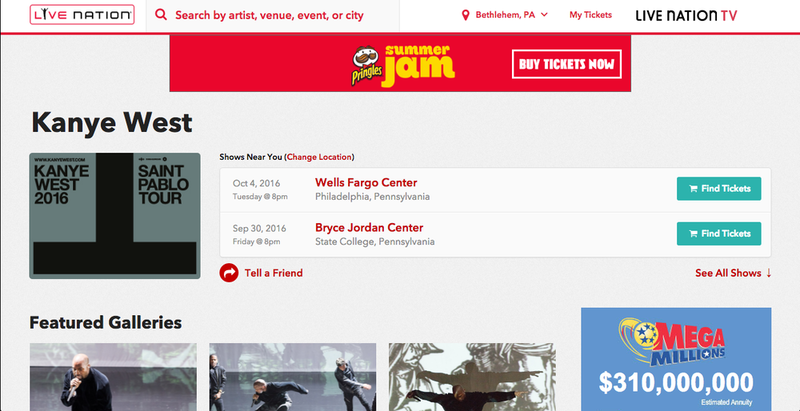 For info on purchasing tickets from TIDAL just log into your TIDAL account via web browser, desktop or mobile app. Prices start as low as $48 and go as high as $1,400.